Maybe you want to visit Block Island with your small dog and you don’t want to make a reservation months in advance to take your car on the one ferry that accepts cars — but you still want to travel around the island. Or maybe you just really enjoy biking, and wonder if you can bring your new love along with you. Whatever the scenario, at some point you’ll find yourself with a bike and a dog that can’t, let’s face it, keep up for that long with a bicycle’s pace. The solution is to carry your dog with you, and I’m happy to report that there are several good products that help you do that safely and conveniently. The European Market Basket, with the liner, pillow and harness options, is a charming, old-fashioned option. Snoozer, the maker of Chloe’s beloved Lookout car seat, makes three bike products, including the Sporty Pet Bike Basket, a padded basket with optional rain cover that hangs from the front of your bike, and the Pet Rider Bicycle Seat Lookout, a larger padded platform that straps onto the back of your bike. The Roof Box Company’s Walky Basket might be a good way to handle the Block Island scenario described above, since it collapses for storage and appears to have a user-friendly attachment that would work with a rented bike. It also readily converts to a shoulder bag/carrier. Yet another approach might be Solvit’s Deluxe Tagalong Pet Bicycle Basket, which was reviewed favorably in the Bike Commuters blog (but be sure to read the comment that talks about paint abrasion). A sweatier approach to handling the Block Island scenario (that is, biking somewhere away from home) would be a carrier that converts to a backpack, so your dog would ride on your shoulders. Intriguing ones I’ve seen include Creature Leisure’s Carry-Den XT and Pet Gear’s line of I GO2 rolling carriers. 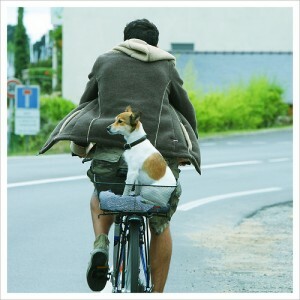 Alternatively, you could pack a dog backpack in your suitcase, like Timbuk2’s Muttmover. Carrying the convertible theme to its limit, PetEgo’s Jet Set Carrier, previously reviewed by Dog Jaunt in its role as an airplane carrier, can (with a couple of accessories) clamp on to your bike and serve as a bike carrier. Unfortunately, although it will keep your dog contained and safe, her only view will be to the sides through mesh panels, and is therefore less than ideal. PetEgo’s PodILove, a roomy (15Lx15Wx15D) dome, won’t work as an airplane carrier, but converts from a bed to a car carrier to a bike carrier, and can be carried conveniently (though not stealthily) over your shoulder. No problem with the view here, which is out the front, and the domed top even provides your dog with some shelter from the sun. Whichever carrier you choose, spend time getting your dog used to it on the ground at first (lure her in with tasty treats; then reward her when she hops in voluntarily). When that seems comfortable, pick her up in the carrier briefly. Gradually work up to walking around the house with her in the carrier. Shower her with treats and praise. Choose a quiet road for your first bike ride, and make it brief and cheerful (and full of treats, naturally). Be sure to use the leash clip that tethers your dog to the carrier! Over time, add distance and traffic to the mix, keeping a close eye on your dog for signs of discomfort (if she seems anxious, back up to the last comfortable step, get her comfortable again, and then proceed a bit more slowly). It may be a snap, or it may take a little while, but what fun it will be to look down as you pedal and see her sniffing the breeze! Keep in mind that she’s getting a lot of sun out there, and she doesn’t have a helmet protecting her from the sun. Some of the carriers have a sunshade (or a rainshade that can serve the same purpose). If yours doesn’t, consider rigging one up with a handkerchief or some fabric and clothespins over at least part of the carrier, so she can get some shelter. A stiffened, opaque fabric like oilcloth works well, and you can use the bit you don’t use as a sunshade for a travel placemat. (If there isn’t an obvious place on the carrier to clip the clothespins, consider the brake cables — clothespins won’t affect your brakes’ performance.) Carry as much water as possible and a collapsible water bowl (or make one of your water bottles a Gulpy), and be sure to keep her hydrated. I’ve got a 15 lb JRT mix and I’m looking for a solution for bike riding with him (we live about 2 miles from a great dog park – a bit far to walk and still enjoy the park, but I feel like I’m cheating when I drive). I’ve considered baskets and back packs. Any product siggestions that you think would fit our purpose?